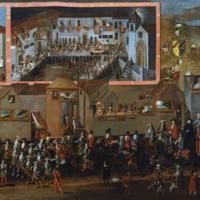 This long painting (600 cm in length, over 19 feet), shows the ceremonial arrival of a Viceroy in the city of Potosí. The event, known as an “entrada,” transpired in 1716. As was common for these public spectacles welcoming new viceroys, Viceroy Morcillo rides into town accompanied by city leaders, local horsemen and musicians. Women watch from the upper stories and balconies of nearby buildings. The painting has been constructed as a series of vignettes. The main procession takes place below. In the upper left corner, are two other scenes related to the Viceroy’s arrival, but taking place at different times in his celebration. This large painting is comprised of three scenes. The framed scene at the upper left shows the Viceroy Archbishop Diego Morcillo Rubio de Auñón in the main plaza of Potosí, about to enter the cathedral. The Casa de la Moneda faces the church, and the Cerro Rico is visible at upper left. To the right of this scene, is a second one, representing the same plaza, which now hosts a mascarada, a dance pageant. Mascaradas were well-known forms of public theater in 17th and 18th century Spanish American cities. In the upper right, a man dressed as indigenous nobility rides upon a platform in the procession. The main scene shows the archbishop arriving in the city. Morcillo was archbishop in Charcas when the king appointed him as interim viceroy, to replace a viceroy removed for embezzlement. Morcillo was 74 years old at the time. Captured in this painting is his pass-through of Potosí on his way from the highlands to Lima to assume his post. The viceregal retinue is pictured at far right, covered by an elaborate canopy. It has just passed through the festival arch, created for the occasion. The painting thus preserves the fantastic ephemeral architecture created for such occasions. The citizens of Potosí spent hundreds of thousands of pesos on their welcome for Morcillo. The retinue is lead by wealthy Spanish and Creole citizens, as well as African and African-American horsemen, suggesting the multi-racial nature of colonial Potosí. Women of high-status stand on balconies and the roofs of buildings to watch the ceremony. African or African-American women and native Andeans are their companions. In the foreground, the painter, Melchor Pérez Holguin, stands near his signature. Melchor Pérez Holguín (1660-1732) was one of the most respected and sought after painters in the 18th century in Potosí and surrounding towns of the highlands. His works—many of which are explicitly religious—appear in numerous convents and religious buildings of the city. This is an oil painting on canvas. It is also a kind of self-portrait, since the painter, Melchor Pérez Holguín has included himself in the scene. While painted in the Americas, this image may have been meant for a Spanish patron, or at least for Spanish viewers. Today it is in the Museo de América in Madrid. Taken together, these vignettes of this painting suggest the drama of public spectacle in Spanish American cities. An unabashed celebration of political power and hierarchies, entradas also provided opportunities for visual expressions of local pride, like wearing fancy clothing and performing dances set to local music. Holguin has depicted a vibrant Potosí, where in social status, economic wealth, and ethnicity are clearly on display. Mendieta Pacheco, Wilson. 1998. Melchor Pérez Holguin: brocha de oro. La Paz: Banco Central de Bolivia. Wuffarden, Luis Eduardo. 1999. “Entrada del virrey arzopbispo Morcillo en Potosí.” Los siglos de oro en los virreinatos de América: 1550-1700. Madrid: Sociedad Estatal para la Conmemoracion de los Centenarios de Felipe II y Carlos V, 146-148.